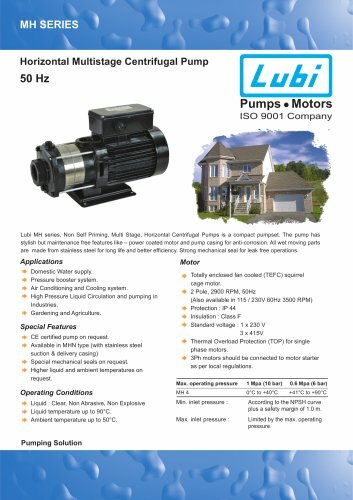 Catalogs > LUBI INDUSTRIES LLP > Pressure Booster Pumps. MH SERIES Horizontal Multistage Centrifugal Pump 50 Hz Pumps Motors ISO 9001 Company Lubi MH series, Non Self Priming, Multi Stage, Horizontal Centrifugal Pumps is a compact pumpset. The pump has stylish but maintenance free features like – power coated motor and pump casing for anti-corrosion. All wet moving parts are made from stainless steel for long life and better efficiency. Strong mechanical seal for leak free operations. Applications Motor Domestic Water supply. Pressure booster system. Air Conditioning and Cooling system. High Pressure Liquid Circulation and pumping in Industries. Gardening and Agriculture. Totally enclosed fan cooled (TEFC) squirrel cage motor. 2 Pole, 2900 RPM, 50Hz (Also available in 115 / 230V 60Hz 3500 RPM) Protection : IP 44 Insulation : Class F Standard voltage : 1 x 230 V 3 x 415V Thermal Overload Protection (TOP) for single phase motors. 3Ph motors should be connected to motor starter as per local regulations. Special Features CE certified pump on request. Available in MHN type (with stainless steel suction & delivery casing) Special mechanical seals on request. Higher liquid and ambient temperatures on request. Operating Conditions Liquid : Clear, Non Abrasive, Non Explosive Liquid temperature up to 90°C. Ambient temperature up to 50°C. Pumping Solution Max. operating pressure 1 Mpa (10 bar) 0.6 Mpa (6 bar) MH 4 0°C to +40°C +41°C to +90°C Min. inlet pressure : According to the NPSH curve plus a safety margin of 1.0 m. Max. inlet pressure : Limited by the max. operating pressure. Booster sets with 2 to 4 LCR pumps. Vertical Multistage Pumps 50 Hz. Three Phase Induction Motors(0.25 to 60.0 HP). Single Phase Induction Motors (0.25 to 3.0 HP). Single-stage bare shaft end-suction pumps 50Hz. Sewage Pumps (1.0 HP to 3.0 HP) 50Hz. Large Volume Water pumps (3.0, 7.5, 10.0 & 15.0 HP) 50Hz. Drainage Pumps (1.0 HP to 3.0 HP) 50Hz. Construction Drainage Pumps(1.5 HP to 10.0 HP) 50Hz. Self - Priming Mud Pumps (1.0 to 5.0 HP). Grinder Pumps(1.2 HP to 5.0 HP) 50Hz. Corrosion Proof Submersible Drainage Pumps 50Hz. Heavy Duty Sewage Pumps (2.0 HP to 60.0 HP) 50Hz. Cast Iron Submersible Drainage Pumps 50Hz. Close-Coupled Vertical in-line Pumps 50Hz. Centifugal Pumps (2.0 to 30.0 HP). Centrifugal Pumps (2.0 to 10.0 HP).